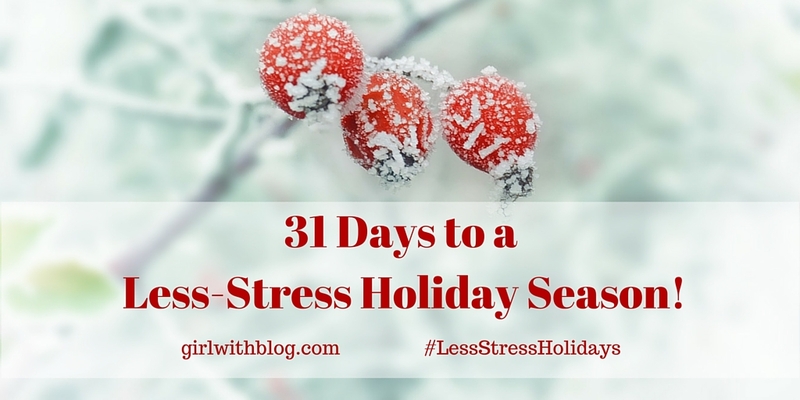 31 Days To a Less-Stress Holiday Season! I have this thing for Christmas. Growing up, my mom always made it a magical time for us. There were cookies, a grand tree decorated to the hilt with heirlooms and popsicle stick ornaments, bedtime readings of the Polar Express and Laura Ingalls Wilder’s The Long Winter. My mom cross-stitched stockings for my siblings and me, and they hung expectantly on the banister. We’d wake early on Christmas morning in matching pajamas, scrambling up the stairs for cinnamon rolls and gifts. We also had Advent calendars, each small box opening to reveal a piece of waxy chocolate. Sundays were spent in the liturgy at our traditional Lutheran church, each week another candle lit on the Advent wreath. A special video tape of Christmas cartoons was on constant replay during December, and my mom brought us to all the Advent celebrations she could find. And the thing is – I never saw her stress over it all. She was a single mom on a teacher’s salary with three kids enamored with Christmas. Pinterest didn’t exist, but pressure is timeless – yet I never saw her buckle under its force. Now that I’m a mama, my ‘thing’ for the magic and beauty of the season is only intensified as I create memories for my kids and family. But I want to do it all in love, not in stress-induced pressure. I need moments of Christmas too, which is why I wrote this book – a daily Advent devotional for me and for you. I wanted to be rooted in scripture, in remembering, in nostalgia, and not let stress consume my heart and my December. I want to be fixed on the coming Christ child as we prepare to celebrate His birthday, and it takes a lot to stay focused amidst the bustle. In addition to the regular busyness of Christmas preparations, our family also celebrates two birthdays between Thanksgiving and Christmas. It can be a hectic season and month for our family. I want to go into it as organized as possible, pockets stuffed with tips & tricks for enjoying the wonder of the season and not succumbing to stress, and I want to share all of them with you. 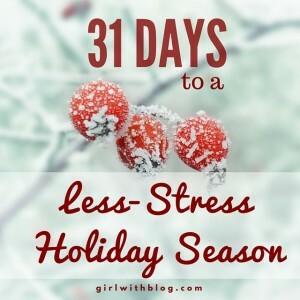 For the next 31 days (every day in October) I’ll be writing a tip, trick, story or recipe to help you enjoy the upcoming holiday-filled season with less stress. When we end the series, it will be November – just in time for the best of autumn, all things pumpkin, Thanksgiving, Advent and Christmas, and we will be ready for it all. Invite your friends, and together let’s work towards a less-stress holiday season! I’m looking forward to reading your series. I love family traditions around the holidays, but stress isn’t my thing either! This is so fantastic, friend! I want to focus on the birth of Jesus and not be all stressed out too. So looking forward to your series. This is such a beautiful idea and something that I really need to read and think about because I love Christmas and tend to go overboard and lose my mind.